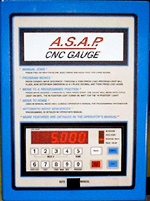 Is our simplest CNC control, for use on most of our gauging products. tubing bender, or you name it. The M4 has been in the field for 6 years without ANY failures! and to produce parts more accurately and at faster production rates. Programming on 12 keys is simple, 7 keystrokes and it’s in position. 2 year factory warranty with Lifetime Support!